Digital Humanities has been called “the culture of the perpetual prototype.” The fast pace of technological change makes it challenging to plan for the long-term future of digital projects, and yet a flourishing culture of digital scholarship demands that we balance the need for innovation against the need for stability and longevity. This presentation will consider the Women Writers Project as an example of a very long-term digital publication and research project, now in its 26th year, and will talk about the tools, methods, and intellectual challenges that have helped sustain this project and given it a durable role in the evolving landscape of digital humanities. Free and open to the public, registration recommended. Julia Flanders is a Professor of the Practice of English and Director of the Digital Scholarship Group at Northeastern University, where she also directs the Women Writers Project. 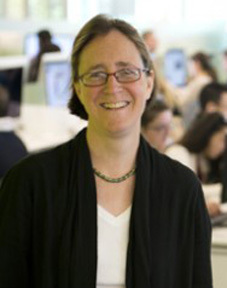 She serves as editor in chief of Digital Humanities Quarterly, and has also served as chair of the Text Encoding Initiative Consortium, as president of the Association for Computers and the Humanities, and as secretary of the Alliance of Digital Humanities Organizations. She holds BA degrees from Harvard University and Cambridge University, and a PhD in English from Brown University. From 1993 to 2013 she worked at Brown University at the Women Writers Project and as a member of the Scholarly Technology Group. Her research interests include scholarly text encoding, textual editing, and humanities data modeling. Click HERE for Julia Flander’s website. Click HERE for the Women Writers Project.